StepUpForAutism- Please help to Create a platform for Autistic Kids. I Support Foundation is an evolving project that works with autistic and under-privileged children to identify their talent and help them walk paths with rest of the world. 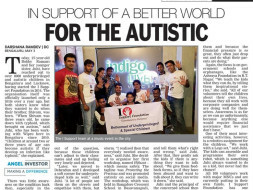 As a part of the cause, I Support Foundation has a school that supports 45 Autistic and Underprivileged children education and overall development in Lucknow and Bangalore. 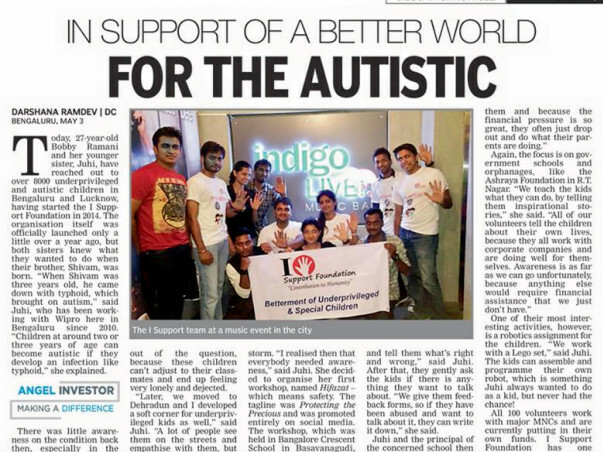 We need your help and immense support to make it possible and create an inclusive society for Autism by spreading awareness, conducting activities for their betterment and social acceptance, which would enable them to fly with different colours; after all we all constitute the society and 'We're Society'! b.Helping parents to interact on the same common platform, help them provide suggestion to eachother for the betterment of kids and discuss the success stories. 2.Support Underprivileged children Education and Development. 3. Build science and computer labs for Autistic kids. I spoke with Juhi from I-Support foundation. She gave me the following updates on the use of funds from milaap. 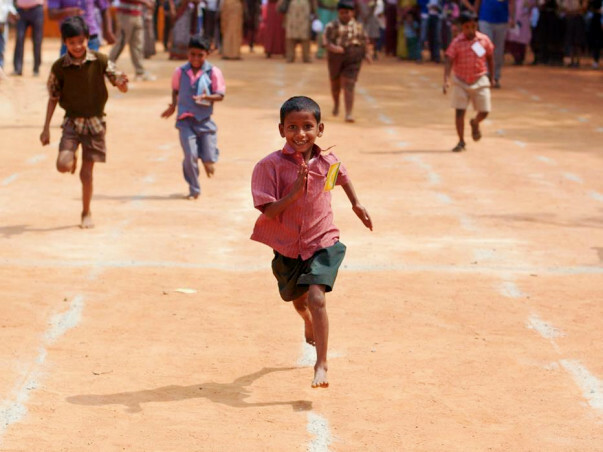 They have successfully opened a School in Bangalore for which basic infrastructure has been setup. They are now waiting for student admissions to start related activities. They have also used the funds for miscellaneous session expenses at Government schools and visits to the Orphanages that they are involved with. They have bought stationary items, sports goods, hygiene kits etc for the students in the school. Funds were also used for making payments to the lucknow school staff and for stationery and uniform for the students. Juhi also told me about the various projects that the I-support foundation is involved in. Below is a short description of the impact of these projects. They conduct training programs for children studying in a low income government school in Austin town on Saturdays. They teach Computers, robotics and spoken English at the school. Enthusiastic volunteers take it upon themselves to ensure that children learn these essential skills. Their work is commendable and results can be seen on the ground. Students who could not even switch on a computer before are now skilled enough to work comfortably on the computer. They conduct programs on computers that help improve logical reasoning among children. The most important skill that children in the school have learned is spoken English. This is an ability that could make a world of difference to the future for these children. They also noticed that a lot of children did not have any idea about possible career options available to them, there was a general lack of awareness among the children. To bridge this gap, they conduct career counseling sessions for the children in the government school and expose them to all available career options and opportunities. An interesting project that I-support conducts for their children is the child safety sessions under a project called Hifazat- 'Protecting the Precious’. This is a session which is focused on Child Safety and creating awareness about child abuse. They conduct this session in government schools and orphanages free of cost. Here they explain to the children what child abuse is by creating awareness on what good touch and bad touch is. They educate them on interactions with strangers and share tips on safety. They organize one to one counseling sessions with the children who ask for help and involve all important stakeholders in order to help solve the issue. They have created an app on playstore – Autism Care ISF. It has information about all schools, physiologists, speech pathologists, hospitals and special educators in banglore. It also has information about best practices, symptoms, assessment and early intervention. Below are some photos I took during my visit to the school at Austin town. I am very happy that one of my friend is part of this. Great job Ajitesh(AJ)/guys. Wishing you all the very best. Great Job Guys. All the Best. Great job Guys ! Am feeling proud bcz of my little bro Praveen :) All the best.